This is the worst app imaginable. More crashes than Smithsonian Channel’s Air Disasters! 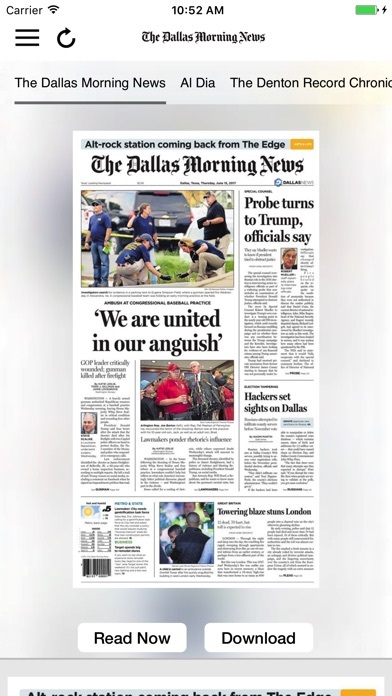 DMN must be out of money because these issues never get better. I have spent all morning trying to reach someone regarding my digital account. Maybe no one works there now because I am just put on hold. My cell actually runs out of battery! For the last few months, this app will crash 2 or 3 times daily while reading the newspaper facsimile. Additionally, this is all occurring after a significant price increase for digital content. The clock is ticking DMN.....THERE ARE OTHER ALTERNATIVES! Really second rate. Crashes frequently. Won’t let you read the paper offline, which is its primary utility. The app is an exact digital replica. It’s easy to navigate and allows me to get my paper without worry about delivery or hard copies stacking up. Downloading has improved somewhat from previous problems but does not work unless you remain continuously connected. If you supposedly download an edition, then disconnect and board an airplane, and do not pay or have access to wireless, you cannot pull up the edition you supposedly downloaded! You cannot download an edition and “take it with you” on your IPad. Therefore, useless. Consistently gives problems when I download the paper to read offline. Sometimes it works but other times it won’t allow me to read the paper I’ve downloaded. Issues include requiring that I log in again to read the paper I downloaded - of course login doesn’t work when offline. Sometimes only the first few pages download (after downloading 100% of paper per app). Or the app just shows blank placeholders where the paper image should be. Very, very frustrating. This has been a problem from the beginning. 6/15/17 didn't work at all. 6/16/17 was able to use it, but, links to continued articles and other WEB sites gone. 6/17/17 doesn't work at all. Seems they cannot get their act together to even retain the fixes from a previous day. I have never seen new software that is put out to the customer to be so untested and full of bugs. The entire IT department management should be evaluated and replaced. 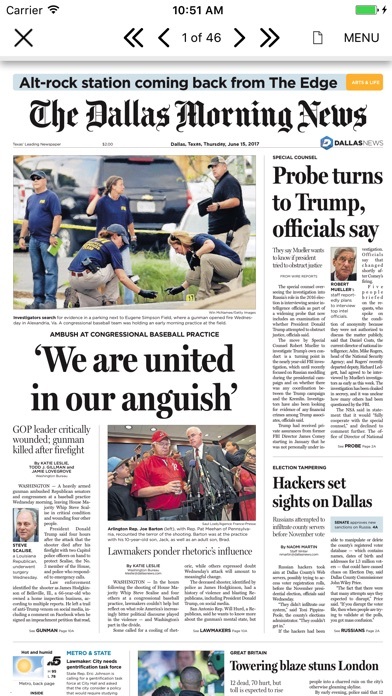 I have taken the DMN for 24 years, but, this may truly drive me to the Ft. Worth paper! My dates above were incorrect. Problem began on first day of 6/16/17 and continued through 6/18/17. The saga continues: As of Monday, was 6/19/17, can only see the Sunday, 6/18/17, paper. Maybe the plan is to always get your paper one day late?????? Technology folks seem to keep breaking new things each day. Forget about them adding convenient features that were in the old app. They can't even get us the current paper in the morning. Not only can you not get today's paper in the new app, you can't get to it in Safari either! 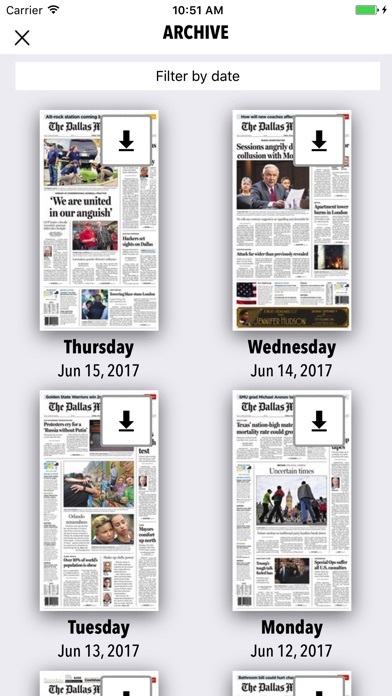 As of 6/20/17 - the good news is I could get to today's paper this morning (4 tortuous days after surprise rollout of "upgrade"). The bad news is I find in the developers' response to other reviews that the jump to continued stories will be available in a few weeks! How can they then call this an "upgrade" if it does not have the same functionality as the old app and some identifiable/significant improvement? It makes little difference to me if there is a slick presentation if it doesn't function! I am becoming numb to the incompetency! 6/21/17 - this is my last update to the commentary on the "upgrade" of this app. Today's problem is when you bring up an article you do not get that article, but, a different article. Another way to show you how poor the response to customer satisfaction is. I refuse to provide any feedback within the app. They open a problem report with an assigned number and send you an email and then promptly close it with another email. It appears they are going to move at their pace and to hell with customers' desire to have an app that functions. At first, I thought they were just incompetent. Now, I think they just don't care. FEEDBACK IS POINTLESS!!!!!! As of 6/24/17 - the paper downloaded quickly. The app is working correctly. The articles that are continued to another page pull up correctly. The only piece still missing is when there is a web site mentioned in an article you cannot tap the link and go to it. This function was in the old app. As of today, the app functions and you can read the paper with ease. I would like to suggest that if there is a significant change to the app in the future, the customer be notified prior to the install and the app be tested thoroughly to ensure it will work for all customers and all functionality that exists in the current app will be available in the upgrade. 7/21/17 - app now works much better. I have upgraded my review to 3 stars. I am hesitant to rate it higher due to the unfortunate rollout of the new app. Having said that, if the app continues to deliver well and future upgrades are fully tested before being given to the customer, I would be happy to upgrade again at a later date. 10/28/17 - Firstly, I want to report the app is functioning quite well and has been an improvement over the old app. Unfortunately, we now see annoying pop-up adds at the bottom of each page. I'm not sure when this began, but, it really affects how much screen is filled with actual news print. If you close the add, the screen space still does not become available and when you move to the next page another add appears. VERY DISTRACTING!! In my opinion, if you pay for a subscription to a newspaper, you should only encounter adds within the newspaper and not online pop-up adds, too. I wonder why they keep fiddling with this app? I am using an iPad mini 4 with IOS 10.3.2 2/5/19 - current status: using iPad mini 4 with IOS 12.1.1 Began reading the paper at 6:15am with no problem. Then app asked me to sign in again at 6:45am, but, login failed. Tried to sign in through Safari and server no longer responding. I understand these things happen, but, what is frustrating is their customer service department doesn’t open until 7am! Does this mean they won’t even know they have a problem until 7am when their customer can call in? Do they think people don’t read the paper earlier than that? Pretty frustrating!!! 2/5/19 Update Called at 7:02am. On hold 22 minutes until recording confirmed my phone number and said it would call me back in a few minutes. It is now 7:48am and no call back and I have to leave. I can only assume by this they know they have a problem. Let’s hope they can get it resolved some time today. Once the paper finally loads, which varies from immediately to minutes, it crashes after advancing through a section and you end up back on the home screen of iPad. You click on the app again and the paper starts back at the beginning and you have to scroll to find the page you were on. As you scroll again to your page, it frequently crashes again and whole frustrating experience starts again. DMN - THIS APP NEED A MAJOR OVERHAUL !!! !